I'm flattered to have been invited to join the Jewelry Blog Carnival, a monthly series of blog posts from a group of well-respected artists. I've been reading this particular blog carnival for some time now, and it had crossed my mind to ask if I could join. Last month I was very close to writing my own post on their topic of inspiration, sort of crashing their party, as it were. Imagine my glee that they since asked me to join the party legitimately!! The blog posts follow a given theme, with each member of the group posting their thoughts in their own way, and then linking to all the other posts. You'll find a list of the members' links at the bottom of this post. Please go check out the party (after you read mine, of course)! This was a hard choice for me. I work in so many media -- how would I choose one piece from everything I've ever created?? So I decided to be a rebel right from the beginning of my participation and to choose one from each of the three main media that I work in regularly. Here, on the appointed day, is my favorite metal jewelry piece. But tomorrow and the next day, I'll answer the same questions about the other two media, glass and fiber. The most meaningful piece of my metal clay work so far is the bronze link bracelet titled Flock. Although its construction is ultra simple, it represents many breakthroughs for me. 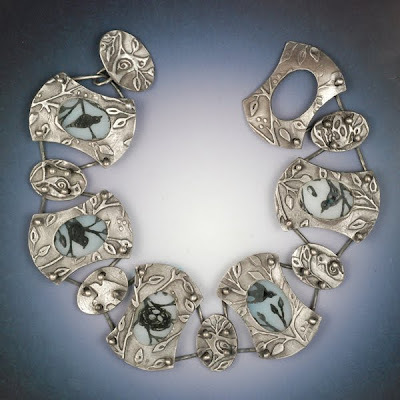 It was the first finished piece of metal clay jewelry that I felt truly represented my artistic vision, where I'd moved into my own territory instead of riffing off an idea from elsewhere. I learned to use photopolymer plates so that I could use my original drawings for the textures -- the first bird tree images were developed for this piece, and now they're everywhere in my work. Photopolymer plates are a standard, quick-and-easy part of my repertoire now. I also struggled early on, like everyone else, with firing bronze clay without cracking, and this bracelet was the first round where I felt I understood what I needed to do (that's because I made all the pieces twice). Assembling the links was an ordeal, although repeating it now is trivial. I originally planned the bracelet with just the pillow links, but added the ovals when I realized it was too short (design opportunity at work -- add something different rather than more of the same!). I didn't plan the wire connections to be angled, which is much more difficult to implement than straight, but looks great and lets the bracelet move like a snake. I didn't plan the clasp properly, and still need to tweak it a bit to make it perfect. Now I realize that I need two ovals together, to get the links to alternate properly, but it took making the silver version wrong again to get it to really sink into my thick head. I believe in persevering. Even with all this work, the bracelet is just a flash compared to hundreds of hours to thread paint a fiber piece. When I wore this bracelet to Bead and Button in June, people asked if I made it in a class (since I was taking bronze classes, I guess), and then when they found out it was mine, if I was teaching it. I had inquiries about selling it over and over again, which I declined until I could figure out how to more easily reproduce it. Making similar pieces for sale has been on my to do list for months now. All the attention at B&B gave me confidence to submit it for publication and other calls for images. Two different photos will appear in print soon: on the cover of the inaugural issue of Metal Clay Artist Magazine and in the 2010 Art and Design of Metal Clay Jewelry Calandar. My Flickr page got lots of hits after Gordon Uyehara showed it in his talk on bronze clay at the Metal Clay World Conference in July. Overall, the bracelet marks a transition for me, from lurking artist dabbling in a new medium, to artist stepping out and claiming some small recognition in that new medium. I like the sense of accomplishment and achievement I feel when I see this piece, and I'll always know that it's the piece that marked my coming out. Sometimes I worry that I play in too many media, that I should stop and focus on one to move up to the next level. I've decided, however, that this piece just validates that I'm an artist, pure and simple, regardless of medium. Those media are starting to meld together, as in the next version of the bird link bracelet, Birdwatching, which has enamel painted glass insets. I go where I need to go, and make every medium I try my own. Vickie, this is so perfect and so rightly a winner !!! I love both versions of it and they shout out you name, which is so cool ! Welcome to the team !!! It's wonderful to have you on board ! Oh, and before someone else smashes some cotton candy and popcorn on your head ;o)))) let me say we're not only composed of metal clayers ! 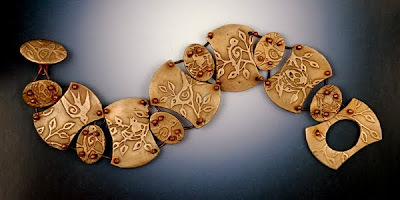 Many of us are originally metalsmiths AND clayers, a couple only do heavy metal, or heavy metal and enamel. NO, no, I won't give out names, people will have to do the rounds by themselves to find out ;o)))) Hurry, hurry !!! Vickie. You Rock!!! What beautiful work you create. Thanks for joining us.... you make the rest of us look good. Absolutely fabulous pieces (this post *and* your other media--wow!) --and I love the story behind how you brought it to fruition. WOW! beautiful bracelet! no kidding it's special! It's so hard for me to think of you as new to metal clay, Your work is so perfectly professional, clean and beautiful. I know it's partly from having a long background as an artist, but metal clay is not an easy medium to master - and you've really reached the heights in a short time. So nice to have you in the Carnival family! I am very happy to see you in the cover of the magazine, your work is wonderful and you have a unique and elegant style. Beautiful, Vickie- and mucho congrats on making the covers of those publications! !